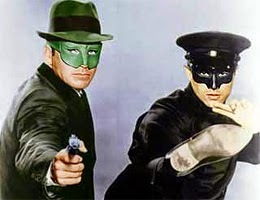 48 years ago on this date of Oct 14 in the year 1966, the sixth episode of the new TV series, The Green Hornet, aired. Bombs dropped from an insect-like helicopter obliterate 2 hoods in a sedan. Britt is after the bootlegging operation behind the killing, so as The Green Hornet he puts pressure on by demanding a share of the moonshiners' proceeds for protection. From their car The Black Beauty, Kato dispatches a "scanner" (small flying remote TV camera) which tracks the undertaking to a dairy farm run by Dirk.